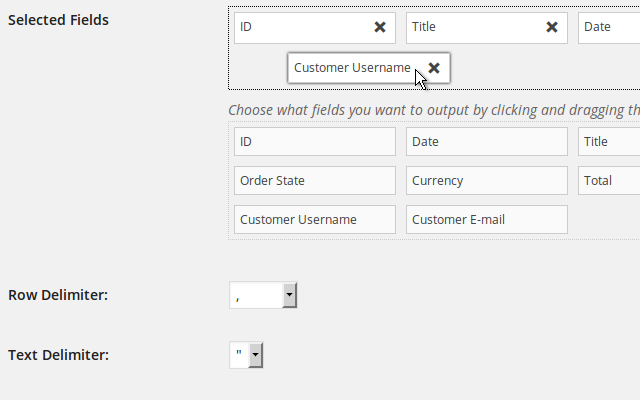 Drag and drop the fields you want to appear in the exported CSV file. 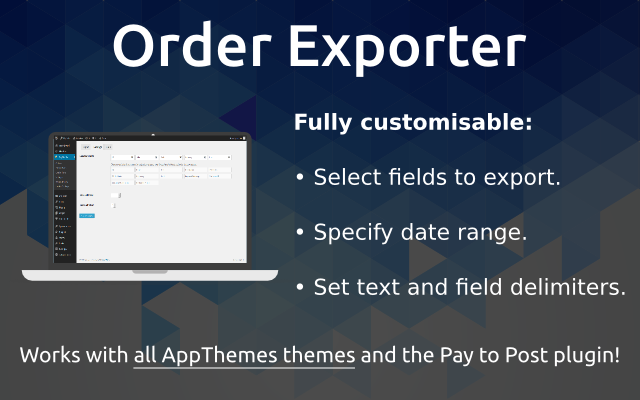 Set the date range you want to export orders for. 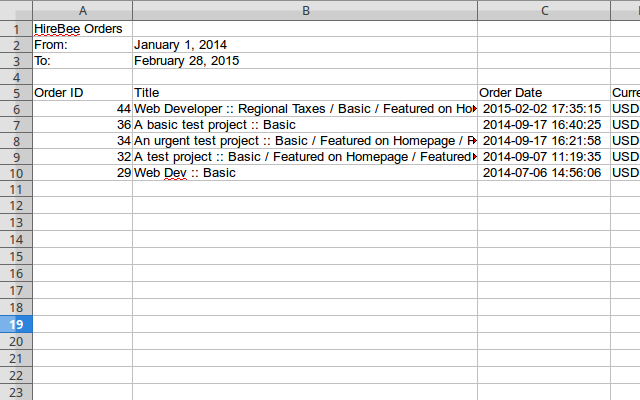 Simplify your accounting by exporting order details to a CSV file. Select the fields you want to export. 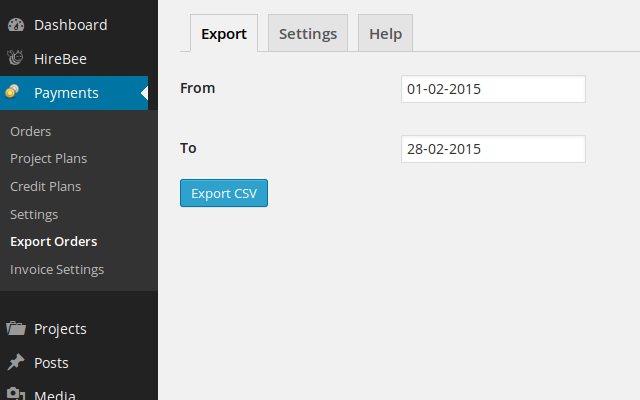 Set the date range for exported order data. Set text and field delimiters. The exported CSV file can be opened in all popular spreadsheet software (including Microsoft Excel and LibreOffice Calc). Works with all AppThemes themes and the Pay to Post plugin. We try our hardest to reply within one working day. To make it easier to reply to your support requests please include enough detail to enable us to replicate the issue you are having. Ensure you have read any relevant documentation or support information. Ensure you are using the latest version of WordPress and the latest version of the appropriate plugin/theme. Try changing any appropriate settings to see if the problem persists. 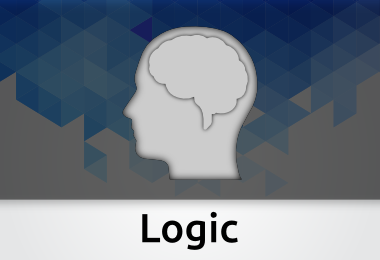 Disable any caching plugins or software to see if the problem persists. Try disabling other plugins or switching to a different theme to see if the problem persists. Attempt to replicate the problem with a clean install of WordPress and a clean install of the theme/plugin you are having a problem with. Responding to questions regarding the use of the plugin/theme. Where possible fixing compatibility issues with other themes/plugins. Providing updates to ensure compatibility with new versions of WordPress and relevant parents themes or plugins. Customisation or modification of the product. Support for third-party plugins or themes. Feature requests are welcome but not necessarily covered by product support. I use the Vantage theme with ‘Custom Forms’ (part of Vantage). Does the plugin allow me to download the Custom fields also? If so I will gladly purchase it. @xpose, not currently but I think post/user meta data would be useful. I will look at adding that for a future version. Hi, I bought the item but is not working. It only allows to download data from this month only, but if I am asking to export orders made months ago, the plugin is not working. Also, I cannot make the calendar work. It doesn’t aloud me to choose any date and if I am putting the dates manually, is resetting automatically. Waiting advise and an update for this plugin. Sorry to hear you are experiencing problems. Please send an e-mail to support@nomadcode.net including WordPress version and theme name and version and I will take a look for you. Hi. What accounting software will this work with? Quickbooks or Sage 50?